Aedes aegypti mosquito is transmitted to human from an infected mosquito. This process usually begins when a person infected with dengue fever virus is bitten by Aedes aegypti mosquito. The dengue virus then spreads when an infected mosquito bites a healthy person. If someone is suffered from a dengue fever previously then it is possible for that person to be infected with dengue virus again since dengue fever is caused by many different types of dengue virus. In this case, there is a chance to develop a severe form of dengue fever i.e. 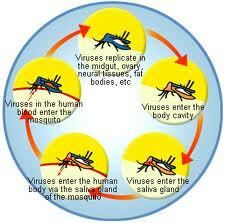 dengue hemorrhagic fever in all those persons who are already infected with dengue virus.